Full-time student Miss Koey Kong (centre) and part-time graduate Miss Sarah Lee (right) were invited to share their learning experience and feelings at the ceremony. 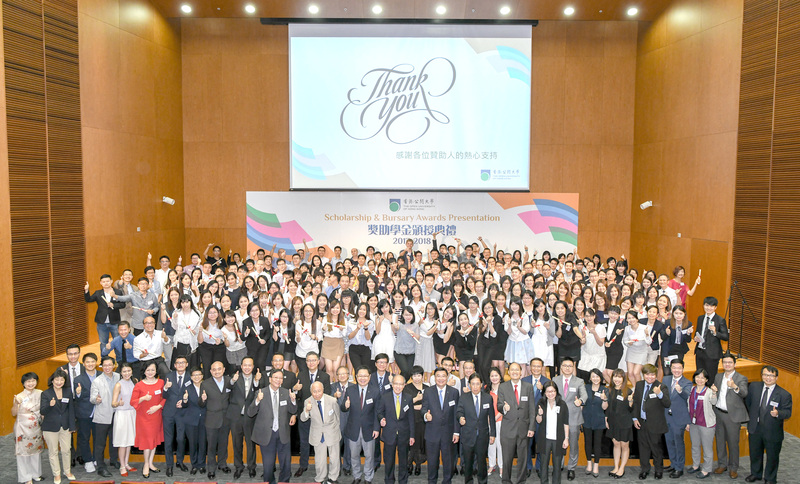 The OUHK presented awards with a total value of over HK$8.2 million to 833 students this year. An awardee takes picture with his family members to share the joy of the occasion after the ceremony. 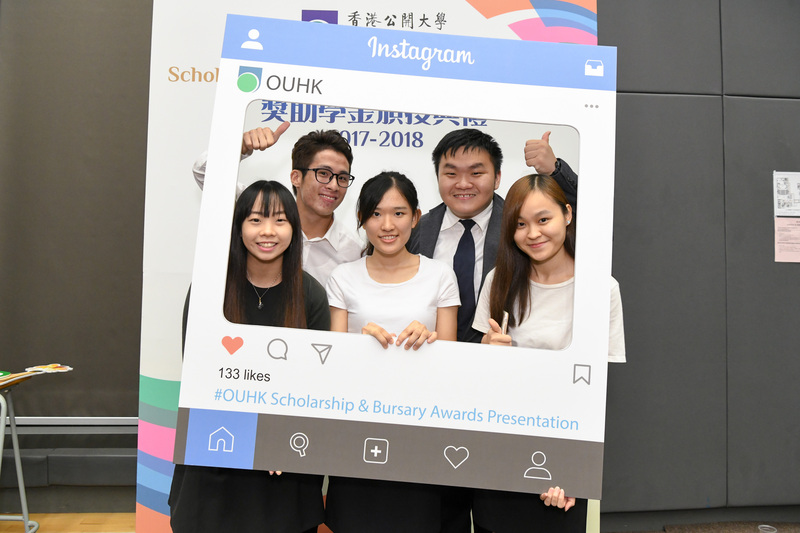 The Open University of Hong Kong (OUHK) presented awards with a total value of over HK$8.2 million to 833 students at the 2017/18 Scholarship and Bursary Awards Presentation held yesterday (21 Aug). Both the amount of awards and the number of recipients have broken the University’s records for the past 10 years, demonstrating a significant increase in support from the society towards the University and its students. This year, 459 students were awarded scholarships in recognition of their outstanding academic achievements, while 374 students were granted bursaries to help relieve their financial burden. The ceremony was joined by over 400 students and their families and friends, along with many generous donors. In his opening remarks, Chairman of the OUHK Council Mr Michael Wong Yick-kam expressed his sincere gratitude and deep appreciation to all donors for their unwavering support towards the University’s Student Assistance Fund. “Tuition fees could be a heavy burden to some disadvantaged students and their families. Nonetheless, your benevolence and support have offered timely assistance to those in need, allowing them to focus on their study and realize their dreams. Your thoughtfulness has also helped nurture more talents for Hong Kong’s future development,” he said. 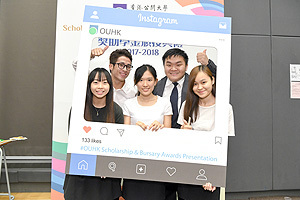 Since its establishment in 1989, the OUHK has been committed to promoting higher education by offering programmes that meet the developmental needs of the society, helping numerous people fulfil their study dreams. “The remarkable achievements and developments we have attained today rely very much on the ardent support from the community. It is gratifying to see the encouraging results in our latest fundraising efforts for the new campus development project and the Seventh Matching Grant Scheme. With your support, we will continue our endeavour to bring the University to next level of excellence,” Mr Wong said. Many donors have been providing support to the University for more than a decade. This year, OUHK is particularly grateful for the renewed support from various donors including the Chan Tseng-Hsi Foundation Limited, Dr Winnie Ko, Prof. Kao Mayching, Tin Ka Ping Foundation, along with numerous others. “With their kind donations, the University is able to provide more support and assistance to our students to facilitate their whole-person development and enrich their horizon,” Prof. Wong said. The 805 OUHK award recipients of the Self-financing Post-secondary Scholarship Scheme (SPSS) of the Hong Kong Government were also invited to join the ceremony. One of the scholarship recipients, Miss Koey Kong Ho-fung, is awarded the “Connie Scholarship” and the “Self-financing Post-secondary Scholarship Scheme Outstanding Performance Scholarship” for her excellent academic achievement. Koey is now in her third year of the Bachelor of Arts with Honours in Language Studies and Translation programme. This is the first time that Koey receives scholarship from the University and she is deeply thankful to her donors and teachers for their kind support. In addition to monetary reward, Koey sees the scholarships as an important recognition of her hard work and perseverance in the past year. The scholarships not only help relieve her financial burden, but also greatly enhance her self-confidence. 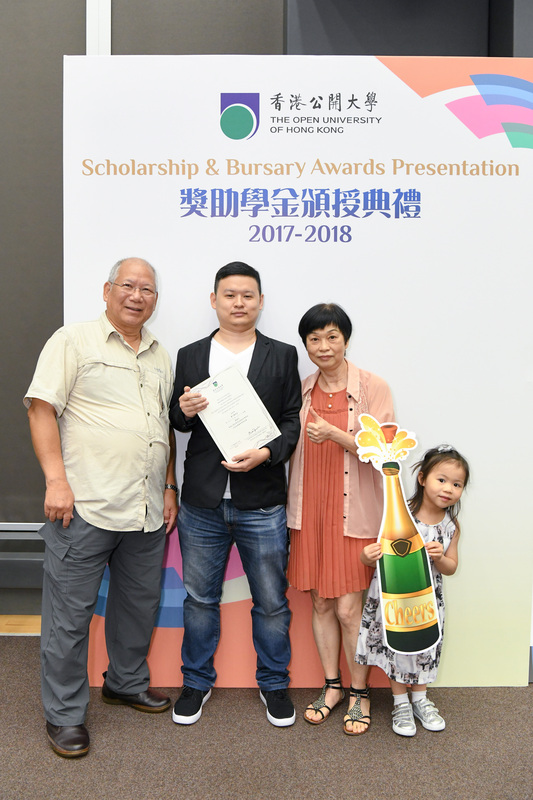 Another scholarship recipient is Miss Sarah Lee Wing-shan who is awarded the “Bank of China (Hong Kong) Scholarships” and “Sunnyside Limited Scholarship”. Sarah joined the workforce after finishing Form 7 and had been a clerical worker at various private companies and banks. For better career prospect, she decided to enroll in the OUHK’s Bachelor of Business Administration with Honours in Accounting programme in 2012. 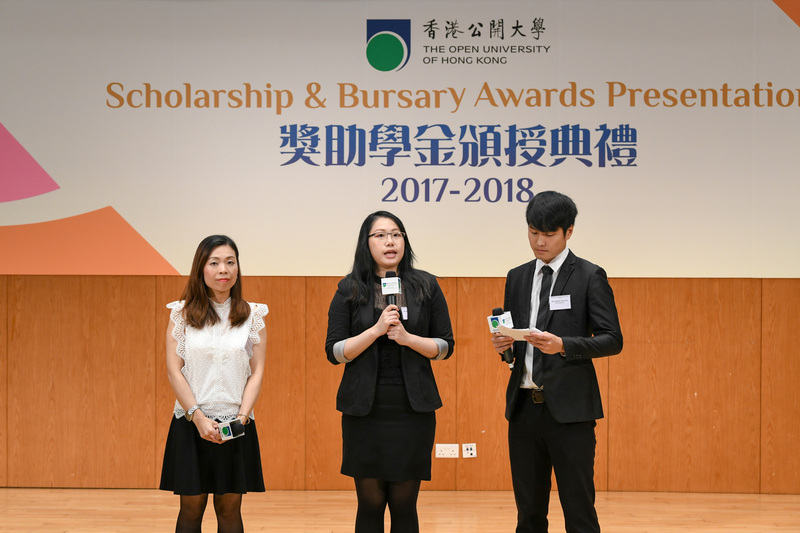 This is the second time Sarah was awarded scholarships from the OUHK, but she is just as excited as ever. Sarah said that the awards are an assurance of her efforts and a strong motivation for her to work even harder. Sarah is truly thankful to her donors for their generosity and support. She also appreciates the extra time that her professors and tutors spent with her and her fellow classmates to help them with their learning. Sarah plans to use the scholarships for further studies in Information Technology and Electronic Commerce. Established by the Government in 1989, The Open University of Hong Kong (OUHK) has developed into a full-fledged university providing high quality and flexible university education at various levels to secondary school graduates and working adults. 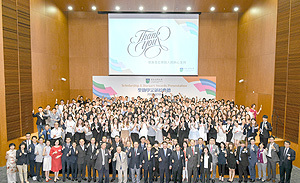 As a dynamic and innovative university, the OUHK currently offers about 220 programmes to nearly 10,000 full-time students and about 9,500 part-time students. Our mission is to advance learning, knowledge and research that meet students’ learning aspirations and society’s talent needs, focusing on practical and professional programmes. OUHK comprises five Schools, i.e. School of Arts and Social Sciences, Lee Shau Kee School of Business and Administration, School of Education and Languages, School of Nursing and Health Studies, and School of Science and Technology. The Li Ka Shing Institute of Professional and Continuing Education (LiPACE) provides lifelong learning opportunities by offering full-time sub-degree programmes, community learning and professional programmes.